5S improves efficiency at the micro-level. It can eliminate searching for tools, for example. It may eliminate wasted steps or long reaches that are ergonomically hazardous. Since workers themselves analyze and rearrange their own workplace, it forces each worker to think about their activities. It develops the "Kaizen Mind." For more on the possible range of improvements in safety, absenteeism, productivity, space and wasted motion, see The Payoff from 5S. Our page on "A Tidy Workplace" reports on some academic research that verifies some of these benefits. This is a point for debate. 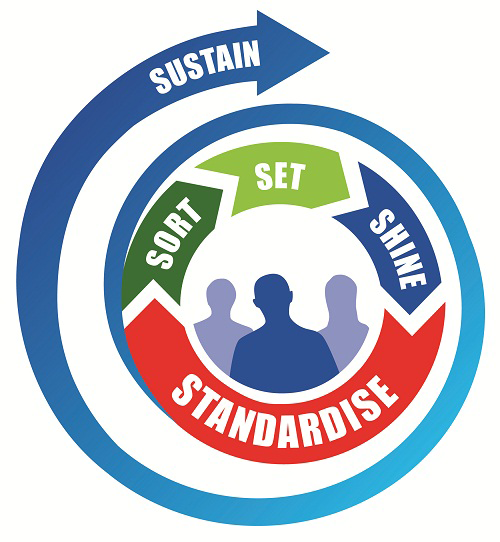 Many firms start their Lean Journey with 5S. Setting implementation priorities involves many factors. It may be best to start with an element having faster and more verifiable savings. The other side argues that, initially, 5S can be relatively easy to implement and has direct benefits. Moreover, it establishes a standard of discipline that begins the cultural change necessary for other elements of Lean Manufacturing. Ultimately, there are many paths to Lean and it is probably more important to just start then it is to find the "correct" path. Cisco-Eagle has assembled some imagery here that helps visualize the 5S process. These images represent different perspectives on an often-subtle phenomenon.